If you have flat feet, then don’t feel alone, because only in the US, one of every four people has flat feet, so it is a pretty common condition. Flat feet are either having a collapsed arch or a very low arch, which is crucial for standing, walking and running, because of the lessened shock absorption which the normal arches normally provide. The arches help keep a normal posture, and with low arches the stress on the hip joint is much bigger, and could lead to some mild to serious hip conditions if left untreated. Overall, the lack of shock absorption leads to increased stress to the heels, toes and legs, and can lead to pronation and subsequent injuries and heel, leg and body pains. But fear not! This common problem can easily be corrected with the right pair of shoes for the right activity! Wearing the appropriate shoes can certainly help people with flat feet. In fact, some studies associate wearing unsuitable shoes with not developing foot arches and with overpronation. So, it is crucial that you always strive to get the best shoes for your arch type and movement type. The best shoes will quickly alleviate any heel or leg pain and will reduce the risk of injury, fatigue and stress on the heels and the legs from all that lack of shock absorption and from the over pronation. Remember that even if you have found the perfectly comfortable shoes for your flat feet, shoes do get worn out and old with time and the older they get, the lesser support and stability they will provide. This is why, it is crucial to avoid wearing worn out shoes, and keep in mind that 300 miles is the average life of running shoes, for example. Support shoes which give added support to the arches and thus help the shock absorption and relieve the stress on the feet and legs. Stability shoes which help keep the feet from pronating, which is often the case with people who have flat feet. Unfortunately collapsed arches often make people pronate which can lead to ankle rolling and other injuries, as well as stress and injuries to the other joints in the foot and leg. Stability shoes help control the pronation and reduce these risks. 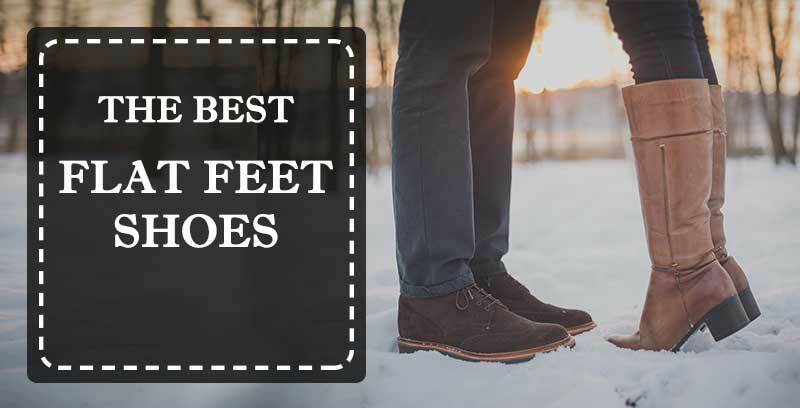 When you are in a quest for the best shoes for your wide feet, you should look for a number of features in these shoes, and keep them in mind, so that you get a proper pair of shoes to help reduce the soreness in your feet and the risk of injury. Whether the heel of the shoe is stiff is important too. If the heel is rigid, then the shoe provides proper support for the heel which is also essential for flat feet. Whether the shoe provides sufficient arch support is also very important when shopping for shoes for collapsed arches. This is necessary, so that the weight of the body is distributed evenly and the stress and pressure on the arches are relieved too. What activity are you going to wear the shoe for? There is a difference between walking, running, and standing or spending hours in hazardous conditions, so make sure you are buying running shoes for running, walking shoes for walking, work boots for work, dress shoes for formal events, etc. So, in general you should be looking for stiffer shoes which help control pronation and which have sufficient arch support. But don’t worry – the fact that a shoe is stiff doesn’t necessarily mean that it needs to be uncomfortable. Quite the opposite, the modern shoe producers use sufficient cushioning, padding and all sorts of technologies and materials to make the shoes feel better and softer. If you wear special orthotics, make sure the shoes you choose have removable footbeds or are wide and spacey enough to fit them in comfortably. In order to find the best shoes for your flat feet, you should go try them on, even if you plan to later order them online. It is recommended that you turn to an experienced and trusted shoes salesman for advice, and always try out several different models from several different brands. Through years of research and trial and error, we have learned to recognize which shoes are best for people with flat feet, so now we would like to present you with our objective reviews of the top shoes for collapsed arches for 2018, which could help you make a better choice for yourself! These are excellent cross training shoes for flat feet. Remember, it is extremely important that your shoes are specifically for your foot type and the activity you are to engage in (running, walking, workout). So, we have dedicated an entire section to the top CrossFit shoes for men and women. make sure to check it out. Brides with flat feet want to feel beautiful on their wedding day too right? Well, these sandals are the perfect pair of shoes to get for your wedding, prom, or other formal event and you won’t need to worry that your feet are going to be sore and tired in a matter of hours! These men’s dress shoes are absolutely beautiful and elegant. You can wear them to work, to formal events, and even to your wedding! Don’t worry, even though they look so narrow and stylish, they provide all the comfort your flat feet need! These very pretty Mary Jane shoes are suitable for ladies who suffer from collapsed arches and want to look and feel comfortable when at work or running their everyday errands. These clogs from Dansko once again prove that this is one of the leading companies for the production of comfortable clogs and shoes for work. This model is particularly suitable for men who have flat feet and spend a lot of time on their feet. One of the top choices for the best tennis shoes for flat feet both for men and for women, the Barricade shoes are stylish, sporty and ultra-comfortable at the same time. The unique midfoot chassis which makes the design of these sneakers so stunning provides amazing support, stability and durability. Actually, it could be that the design captures our attention so much that it is by Stella McCartney. If you want great tennis shoes to help you stay active and feel great even if you have flat feet, then these iconic US shoes are the ones for you! So, hopefully we were able to help you choose the shoes you need for your flat feet, or at least the features you need to be looking for when shopping for the most comfortable shoes for collapsed arches. Good luck, and remember to always choose the shoes in accordance to the activities you are planning to wear them for. After all, the big shoe manufacturers have spent year and are spending millions on research and design of the best shoes for different activities and for different types of arches and movements, so you better take advantage of all the experience and expertise. Plus, getting the right shoes for the right activity will improve your performance and your mood, because you will not feel that nagging soreness and pain from wearing unsuitable shoes. So, go ahead and get the bets shoes to help you deal with those flat feet!